I was most impressed with Mr Munson's work, late 2012, on a complex orchestral score needed in a hurry for the San Francisco Symphony in early January of this year. He rose to the challege, of difficulty & of urgency, with compete confidence, interpreting my handwriting, querying anything doubtful, discovering inconsistancies & actual mistakes, sorting out some aspects of the vast instrumental forces involved that I'd overlooked, with admirable patience, speed, & competence. I can't imagine this job, or any other comparable, being better done. Cordially recommended! Faced with the seemingly impossible task of constructing orchestra parts from an unfinished manuscript score, I knew we would be able to accomplish the job and have excellent results once Bruce signed onto the project! His expediency, insight, and expertise were exemplary and throughout the duration of a very difficult assignment he maintained a positive approach and sense of humor! He was very patient in dealing with our many requests and had everything done on time which was truly amazing since the work was over twice as long as anticipated! He is an excellent copyist with great attention to detail, a true master of Sibelius, and an absolute pleasure to work with. Bruce Munson is a real treasure - not only is the quality and consistency of his engraving exceptional, but his knowledge of and facility with the Sibelius program itself is unparalled. He deftly conducts our constant flow of divergent projects, accelerated deadlines, changing personnel, and challenging files, all without missing a beat. In addition to excelling in the field, Bruce is committed to the clients he takes on, which provides another layer of comfort - he goes out of his way to solve problems as soon as he anticipates them and keeps you informed, often coming in ahead of deadline. He is also going to help us overhaul our file storage and access protocol and conduct a rudimentary Sibelius training session for Rork Music staff. Bruce joined Mr. Getty and Rork Music Staff and associates at a recent recording session with Sir Neville Mariner, where his keen ear and intimacy with the scores greatly faciliated the recording of multiple new works in a several day period. Bruce's participation was much appreciated, and his personable demeanor made him a welcome addition among his traveling companions and colleagues. Bruce Munson has been an integral part of my musical team for over five years. He was deeply involved in the planning, engraving and execution of all the work on the score for THE BONESETTER'S DAUGHTER, my opera with Amy Tan that premiered September 2008 at the San Francisco Opera. Bruce was the indispensible person - preparing the scores to meet the complex demands of an ensemble that included Beijing Opera percussion, Suonas, marching bands and singing Chinese acrobats. He was at all the orchestral rehearsals, editing the scores as I made the changes. I could not have done it without him. Throughout it all, he was a pleasure to work with - always reliable, meticulous and extraorindarily efficient. I wouldn't want to do anything like it without him. We've collaborated with Bruce Munson on a variety of Sibelius projects over the past many years, ranging from Sibelius education to digitizing, proofing and editing public domain works; and arranging, setting, editing and formatting new original works for performance. Our jobs often have extremely short turnaround times, and Bruce has without fail met our deadlines while producing top quality work. He trained Michael Tilson Thomas and our staff on Sibelius use and continues to work with us often when we have questions. His expertise has been unparalleled and invaluable. Bruce is an absolute pleasure to work with - his engraving is beautiful, and he's a smart, very knowledgeable musician, so his eye and ear are attuned to details many other less accomplished copyists would miss. He's a pleasure to work with - straightforward, honest trustworthy, and reasonable. I always feel my projects are treated with the utmost care, even when they are smaller jobs. On larger jobs, and under time pressure, Bruce's calm demeanor and professional focus are great assets for any composer fortunate enough to have him on his team. I feel very fortunate to have Bruce Munson in my corner to help translate and clarify my forays into the classical orchestral domain. I see my primary purpose in this area as exporting the groove-based rhythmic techniques of my group, the Turtle Island Quartet, into the string section of the orchestra, and secondarily to work with the traditions of the other instruments that I am less experienced with in order to attain the overall sonic picture that I am going for--a stylistically integrated approach that will push the orchestra to the limit of its ability. This necessitates a music engraver with a wide range of experience with various American vernacular and world music styles grounded in a solid understanding of the great 200-year-old symphonic tradition, willing to experiment with an innovative and sometimes confusing notation style that must simultaneously be quickly absorbable by the musicians. Bruce is the man for me! Musical proficiency, expertise in Sibelius like no other, professional, gracious, responsive, with an amazing attention to detail: Don't use Bruce Munson. We'd like to keep him to ourselves. I've worked with Bruce on six commissions and he has always delivered ahead of schedule and with meticulous attention to detail. 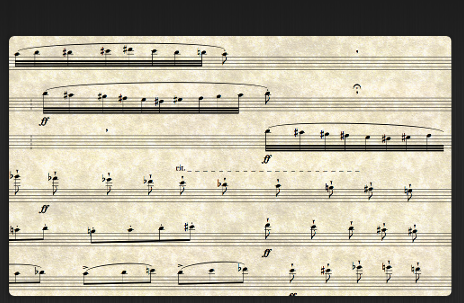 He is a pleasure to work with and quickly assimilated my layout and notation preferences. Most importantly, he brings a keen eye and thorough knowledge of how to make the score and parts look great. I've commissioned over 40 works and without question Bruce is at the top of my list. Bruce Munson was my copyist on a commission from Miller Theater in New York. He did a fantastic job. The parts (in Finale) were clean and extremely legible. In addition he was easy to work with and patient with me during an exciting but stressful period. I would hire Bruce again without reservation and suggest him to everyone who’s looking for a good copyist. I would gladly recommend Bruce Munson for your engraving needs. His work is of high quality and he is quite knowledgeable of engraving rules. As co-publisher of the Saint Augustine Hymnal I was most pleased with his work. The notes are crisp and clear, carefully formatted, and the text is easy to read.